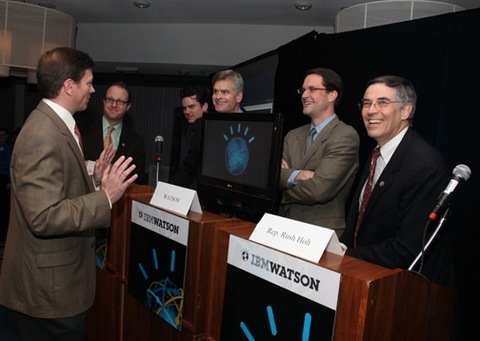 Two weeks after IBM’s computer Watson trounced Jeopardy! masterminds Ken Jennings and Brad Rutter, Rep. Rush Holt dealt the upstart trivia champion computer a defeat on Monday. The New Jersey Democrat beat the scrappy computer $8,600 to $6,200, though no money was exchanged in the mock match. Holt, a five-time Jeopardy! champion, had a leg up on other contestants and a home-court advantage — the match was on Capitol Hill. And being a nuclear physicist couldn’t have hurt. Earlier, Watson defeated Holt’s fellow members of Congress: Reps. Bill Cassidy, R-La., Jared Polis, D-Colo., Jim Himes, D-Conn., and Nan Hayworth, R-N.Y.
Himes and Polis tweeted as the match unfolded and their chances of winning fell into a tailspin. So who is Rush Holt? Holt emerged from a venerable political family. His father was the youngest senator in U.S. history, elected at age 29, and his mother was first woman to serve as Secretary of State in West Virginia, where he was born. Holt launched his first congressional campaign in 1998, but not before establishing himself as a high-level physicist. He served as assistant director of the Princeton Plasma Physics Laboratory, famous for its magnetic-fusion research. He focused on alternative-energy sources and, according to his website, developed a patent for a solar-energy device. Holt is a runner and an avid reader, with a soft spot for American history and revolutionary war battlefields, staffers say. In office, he’s pushed for more research and development funds, support for innovation and less dependence on fossil fuels.